Diary of a Naturopathic Student: Should I Eat Carbohydrates? Carbohydrates are an important part of the human diet, so important in fact that the Australian dietary guidelines recommend that 45-65% of your daily kj intake should come from carbohydrates. But what exactly are carbohydrates? Carbs are made of carbon, hydrogen and oxygen atoms. They are the basic building blocks of plant structures. Plants store their energy as starch and get their structure and strength from cellulose and dietary fibre. Dietary sources of carbs include grains, legumes, fruit, root vegetables, dairy food and processed foods. The media has a lot of people scared of carbs. Lets get one thing clear, carbs are good, as long as they aren't refined or processed. Once they are processed, then they become scary. Refined and processed carbs include white bread, pasta, cakes, white, raw and brown sugar, and sweets. Excessive intake of refined carbs can cause insufficient fibre intake and depletion of nutrients and may lead to stroke, dyslipidaemia, inflammation, diabetes mellitus, polycystic ovary syndrome, obesity, and gall bladder disease. This is pretty worrying considering that the western diet consists of 40-50% carbs with the majority being refined or processed and that in Australia the mean daily intake of refined sugar in 2-18 year olds is between 26.9 to 81.6 grams. Carbohydrates are not to be feared though! Good quality, whole food carbs such as whole grains, legumes, fruit and vegetables are a healthy energy source that are packed with nutrients. When eating grains its important to choose ‘whole’ grains over ‘refined’ grains eg) brown rice over white rice. They still have their bran and germ attached which contain fibre, B vitamins, trace minerals, antioxideants and vitamin E, whereas refined grains only have their endosperm as the bran and germ is removed during the processing and are therefore missing those nutrients. A deficiency of carbohydrates in your diet may lead to low energy levels, muscle tissue loss, dehydration, nutritional deficiencies, and constipation. Apart from whole food carbs being good for you, eating them is also good for the environment. By eating a lot of veggies and a little meat, instead of a lot of meat and a little veg, or an apple instead of a packet muesli bar you are reducing the amount of energy used to create your meal. 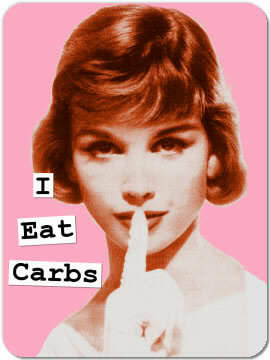 So to sum it up, don't be afraid, eat your whole food carbohydrates! Oh, and one last note, if you choose to cook your carbs, they are best steamed or cooked slowly. Using dry heat such as baking in the oven or grilling on a hot plate can form advanced glycation end products, which may lead to disease.